Sionnach is a fine, graceful creature who typifies the beauty and harmony of the natural world. 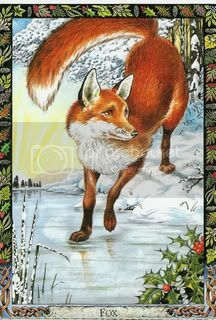 Working with the power of the fox, you will know when it is time to come out into the oipen and be counted, but you will also know when it is time to remain silent, to keep your own counsel. With others you will be able to be diplomatic and 'strong in council'. If you are working with fox-power, you need to ensure that your skill and diplomacy do not become dishonesty or slyness. Remaining silent or becoming invisible so as to watch the unfolding drama, is an asset that can bring with it its own special culpability if it is not tempered with wisdom. If I may, I would like to ask you to help me in interpreting a recent event in my life that revolves around the fox. I believe that the animal may have been trying to send me a message but I'm having trouble determining it. A few weeks ago my fiancée and I were sitting on her back porch around midnight just looking out into the trees and the marsh. We were just about to go in when we heard a screaming/growling sound that made us sit back down. After a moment I recalled the sound from my childhood, these were foxes fighting. We listened to this vicious little dogs go at each other for about fifteen minutes when all noise, the whole marsh over, stopped. A few days later, I went for a walk in the woods around this marsh doing a walking meditation. Out of the corner of my eye I saw what appeared to be a tuft of fur, upon further investigation I found the body of a grey fox laying on a fallen tree that I typically walk on to see the marsh better. I have watched this fox's body for many weeks thinking that I could do something to mark this in my life. Just a couple of days ago I determined that I would take a trophy of some kind if the fox would only tell me what I might have. It eventually struck me that I would keep his skull in a European style mount and this is what I did. I still feel like this fox has more to say, do you have any input or thought as to how he may be talking to me? Well, if we knew who he was, he wouldn't be Merlin, now would he? I'm not sure if this could help but do you have a spirit guide? Perhaps the fox would like to journey with you or need your assistance in his own journey. I've had a similar experience very recently when I found and injured redtailed hawk in the road. I covered it with a blanket and took him to an emergency veterinary hospital. I felt horrible as I didn't connect with him as I was driving but could feel his spirit and it wasn't one of the hawks I know around my home. Unfortunately he passed on the way to the hospital. That night I decided to journey to the Otherworld and he was there waiting for me. He didn't say anything but just looked at me and into the distance. He flew next to me as I walked and for some reason I knew it was our time to part. As I stopped walking he continued on into the beyond. After I returned it dawned on me that I may have been his spirit guide and that animals may get lost on their way sometimes and need some help. I'm greatful that he trusted me for only meeting me in his final hour. It was a very powerful experience and I hope this helped or I may have completely missed the mark. I have found my totem, a furred sea lion, and I have not yet had a chance to consult him. I had never thought that a person could be the otherworldly guide to someone/thing else so that is something I will meditate on. No problem, let me know how this turns out as I'm curious now.